I completed my first Advanced Study Harold class at UCB, with Kate Zelensky. I'm currently enrolled in my 2nd Advanced Study Harold Class at UCB, with Shaun Diston. I was accepted into my first Advanced Study Performance class at UCB with Kate Zelensky, starting next month! My indie improv teams have performed numerous shows around the city, and we still host our show the first Thursday of every month at Slake. The next one is next Thursday, February 4th at 8pm! I've had more freelance articles published on NY Blueprint, and I wrote my first freelance article for Runt Of The Web. The website for West of 10th, the theatre company my friends started over the summer, is live! Last summer I helped them promote their production Matt & Ben, and we will be announcing a spring show soon. The app Headliner hired me as a certified Headliner. I write jokes and post videos several days a week on the app. 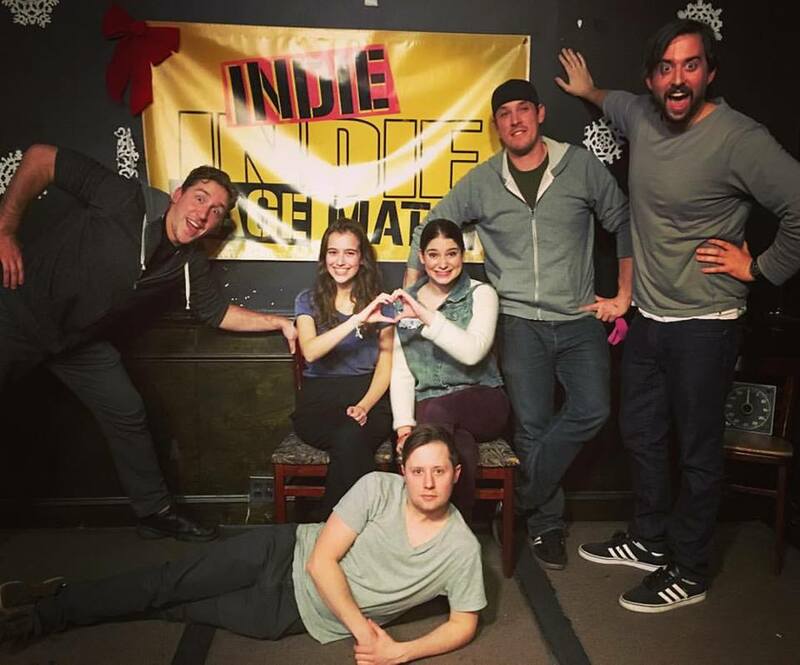 My improv team Hephaestus, one-time Indie Indie Cagematch winners! So many shows coming up! And they're all FUNNY and FREE or CHEAP. Come support me and my friends with your ha-has. My ASH class has also formed an indie team called Good Console! 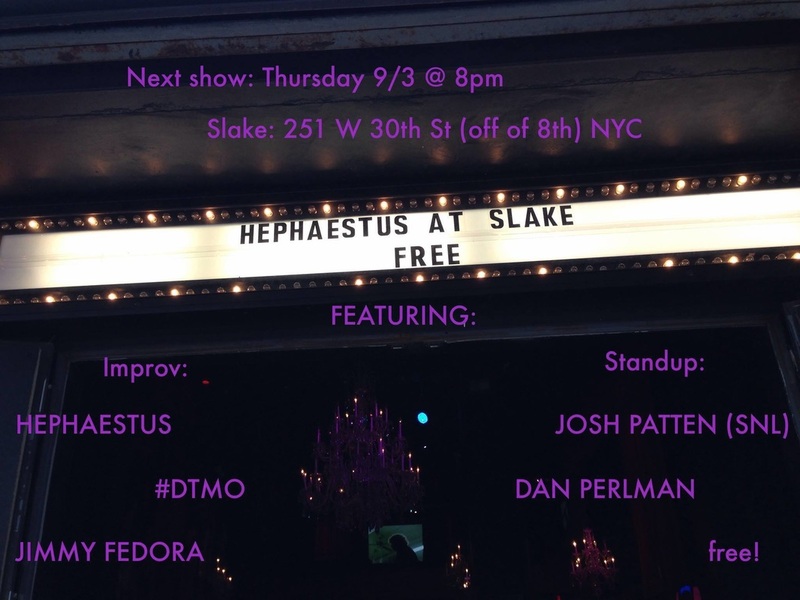 I've got a few improv shows coming up with them as well as Hephaestus and Hot Medicine (detailz on my ~homepage~). 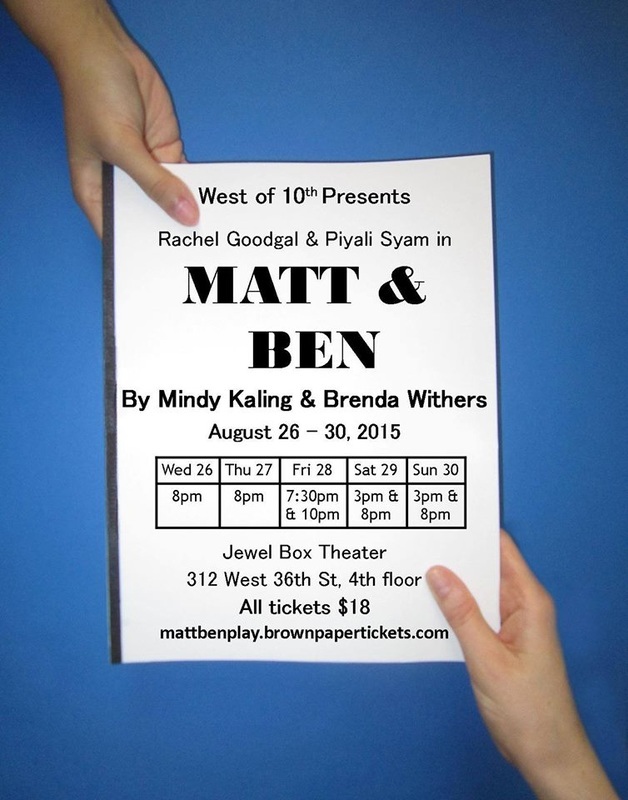 Yesterday, West of 10th's production of Matt & Ben had its final performance. I was the publicity coordinator for the show, and I was also on the stage crew and worked in the box office! Matt & Ben is a hilarious play about Matt Damon & Ben Affleck, and I'm so glad I was able to help some great friends put on such a wonderful, hilarious, and successful show! Short Film, Improv 401, Reductress Article, and More! 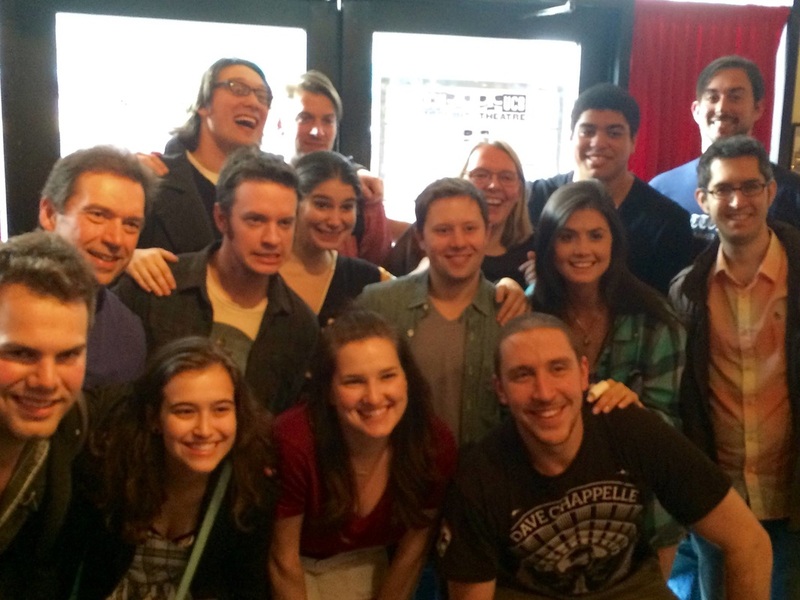 I started Improv 401 at UCB! Our first show of three will be at UCBeast on 4/24 at 4:30pm. 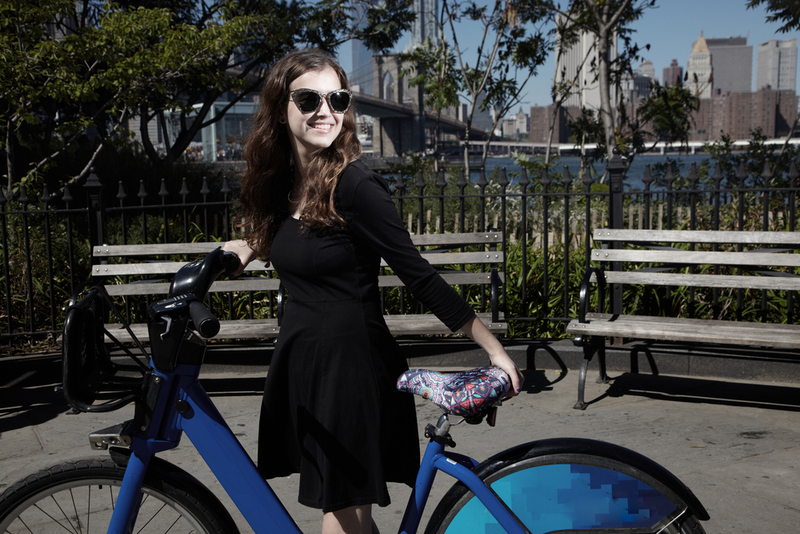 Here&apos;s my latest article for NY Blueprint! It lists 12 NYC Kosher restaurants staying open for Passover this week! www.nyblueprint.com/kosher-kounter-shabbat-holidays/12-kosher-passover-restaurants-nyc. Craziest for last!!! Reductress, the "one and only fake women&apos;s magazine," published my first article for them yesterday! So many UCB performers I look up to write for Reductress, and I still can&apos;t believe my name and work are on their website! Here&apos;s my article, which is about a very important issue in our society: www.reductress.com/post/woman-caught-being-the-11th-like-on-her-own-instagram-photo. While you&apos;re there, read some other articles too - the headlines alone are always brilliant. My apprentice class had our monologue performance at The Barrow Group a few weeks ago. The photo on the above left is me performing an Amazon customer review of Bic Cristal Pens For Her. My acting class at The Barrow Group is currently working on Film & TV scenes. 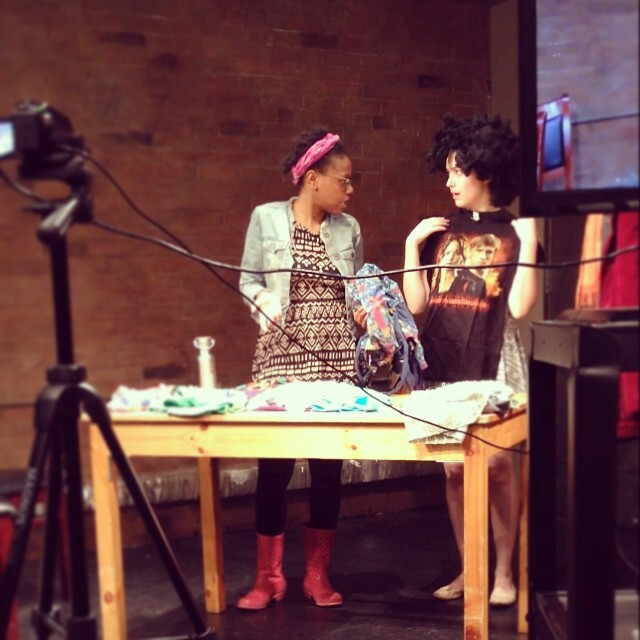 My classmate Cocoa and I did a scene from Broad City last week! Photo above right. Two of my satirical articles were published for www.absrdCOMEDY.com: www.absrdcomedy.com/author/maynotbecool/. http://www.nyblueprint.com/comedy-television/broad-city-returns and http://www.nyblueprint.com/nightlife-shabbat-holidays-week/where-party-purim-year (although the second one is kind of irrelevant now that Purim's over, haha). I'm halfway through Sketch 101 at UCB. It's been challenging, but I'm learning SO much. I'm starting Improv 401 at UCB this week, so I'll be in three shows with my class in April & May - stay tuned! I've been interning at UCB Theatre in Chelsea since last month - I still can't believe I get to work at the theatre, and see so many great performers every week. It is the coolest. - I started an internship at UCB - I'll be working at the comedy theatre one night a week for the next few months! - I'm starting Sketch 101 at UCB next week. - I created a writing page on this website, and a tumblr where I'll be posting some attempts at comedy writing. I was pretty bummed to find out that Blue Line Shakespeare's production of Twelfth Night has been postponed indefinitely. My suitcase was packed, my script was all marked up, and I had told everyone I knew about it. But what can ya do. I'm trying to make the most of the extra time I have at home, so my brother and I decided to write and film a sketch. We are obsessed with our grandma and had a feeling she would have star power, and we were right. We made it just for fun so it's not perfect (shoutout to my bro for laughing right next to the mic while it was rolling) but we are even more obsessed with our adorable grandma now (shoutout to grandpa and his cameo too!). Check out "Instagrandma" below, and please subscribe to our new channel, The Dual Citizens! 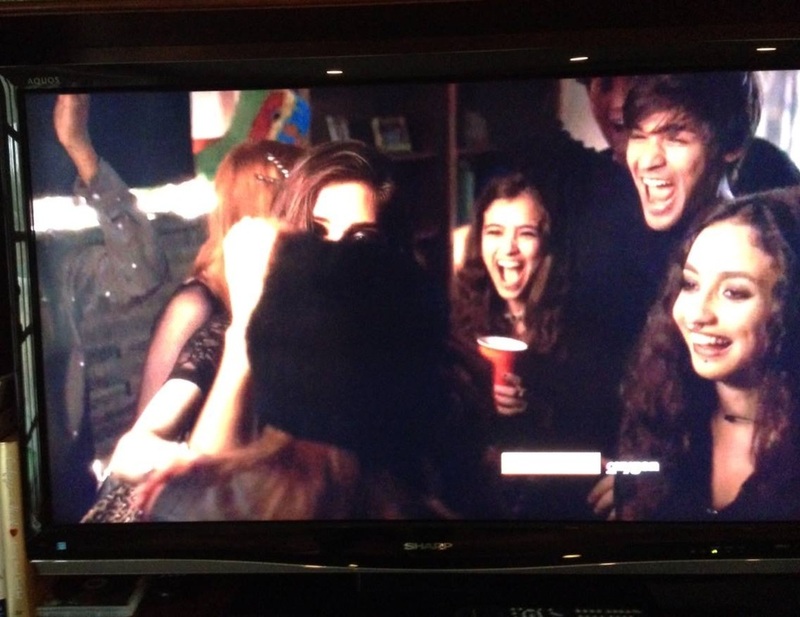 "My Crazy Love" just aired on Oxygen last week (see below picture). 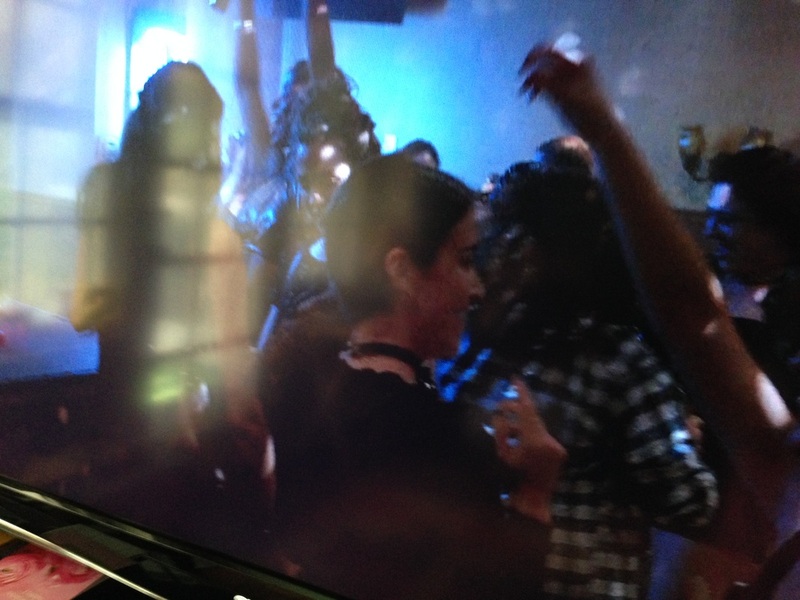 It was just an extra gig but still fun to see my face so clearly on TV! 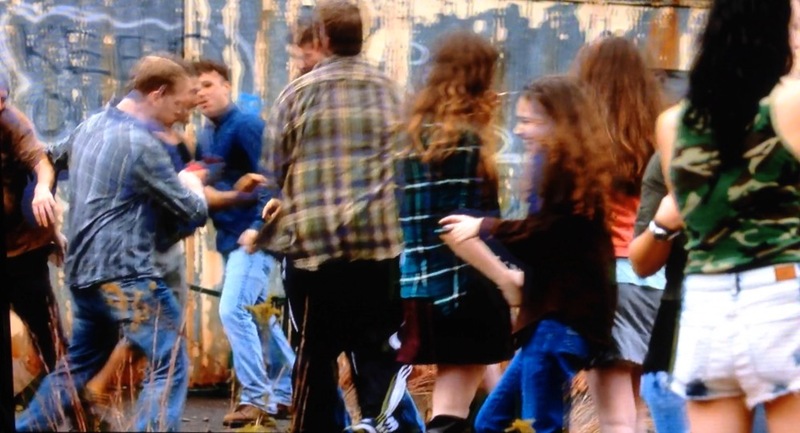 The show is actually hilarious - I'm in season 1 episode 6. My other IMDb credit is the short film "J Doe," which should be complete by the Spring. 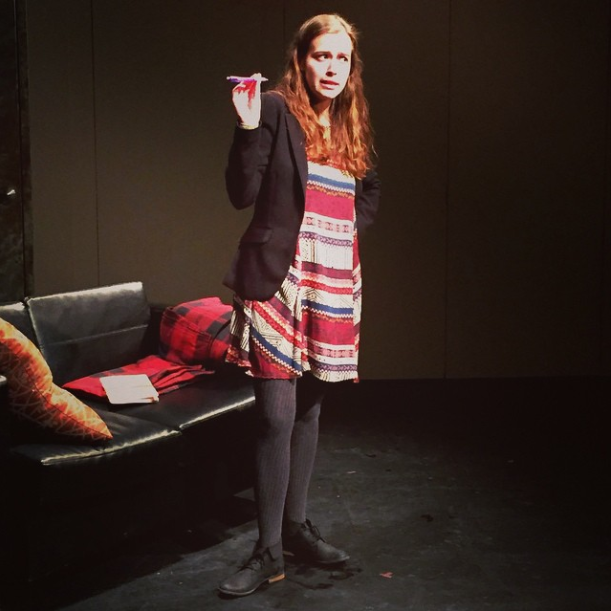 Last week I was in a reading at the Treehouse Theatre in midtown. It was John Clancy's "Fatboy." There were a few other Muhlenberg alumni involved in the reading, who were so great to get to work with! I'm gearing up to go to Mississippi for Twelfth Night in just a few weeks. Can't wait to Olivia it up with Blue Line Shakespeare! 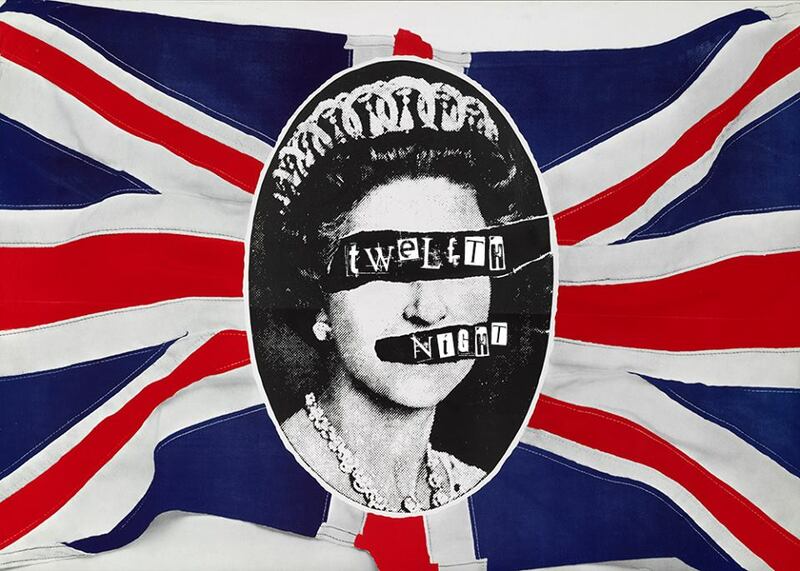 Twelfth Night﻿﻿ - heading down south! I am thrilled to announce that I have been cast in Blue Line Shakespeare's production of Twelfth Night as Olivia! The contract is signed and the flights are finally booked - I'll be going to Columbus, Mississippi this January for about a month for the show! Twelfth Night is one of my favorite Shakespeare plays, and playing Olivia is a dream come true. I can't wait to head to some warmer weather, meet the rest of the cast and crew, and get started!